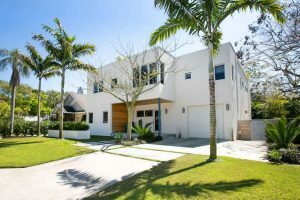 Whether yo u prefer the activities of Downtown Sarasota or the tranquility of this areas pristine gulf front beaches, the location of this modern home is close to it all. Nestled in a quiet & highly desired neighborhood, just West of Tamiami Trail, this property offers all the benefits of Sarasota living at its finest. 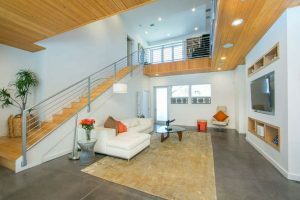 Every detail has been considered; an open & spacious floor plan, 11′ sliding glass doors opening to your own private pool & courtyard oasis; clean lines, exposed materials & a separate two story guest house or studio space. Polished stone concrete floors throughout the main living space. 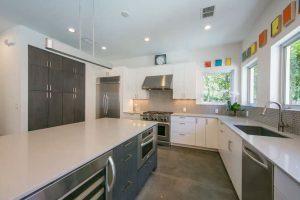 Caesarstone counters, stainless steel appliances, gas range & a spacious island in the kitchen will make any chef smile. The luxurious master suite features blond hardwood floors & a bonus room filled with natural light. Certainly a must see property!